In the event of a power cut, this could be you. All Christmas day long. Hello Christmas, you jingle-belling bounder, you, rolling up into the place all covered in tinsel and fake snow. We see you, eyeing up our guitar, waiting to request a song. You just try it. We're ready - after all, Christmas comes but once a year, and it pays to be prepared. Christmas, as we all know, begins in late June and ends several months later, when the last scraps of turkey have been besandwiched and dutifully eaten. In the decadent glow of late capitalism, Christmas isn't simply a day, it's an extended carnival of spending, overeating and tiny plastic figures of baby Jesus. It's what he would have wanted, probably. The point is, the holiday season is a marathon, not a sprint - and a marathon you must undertake drunk, carrying a guitar case, and on a full stomach. People love to sing at this time of year, and you will be required to provide music in a bewildering array of situations, from actual gigs to house parties and impromptu post-turkey singalongs. It will require stamina, an iron constitution, and no little amount of planning if you are to emerge alive. Gird your loins and prepare for the festivities. For some, Christmas is little more than an excuse to begin drinking on 1 December, and carry straight through until 1 January. Coincidentally, these are the same people that will jump on the mic and incoherently scream as you try to play I Wish It Could Be Christmas Every Day at your first pub gig of the season (see #7, 'Tolerate the dickheads'). If you are to survive Christmas with your liver intact and guitar unsmashed, you must not join the ranks of the terminally unsober. Go hard for a month, and by the time you stagger to the final gig you'll feel like microwaved dogshit. Your playing will sound even worse. Heed our advice, children: save the liver-hammering until you're safely through the gig-tunnel. Speaking of gigs, Christmas is an excellent opportunity to get out there and play to proper crowds. Any regular gigger will already know this, but this time of year really is a goldmine of great crowds and good cheer. The pubs and bars are the busiest they'll be all year, and the punters want them some entertainin'. This is your chance to get some great gigging experience (there is no crowd quite so receptive as a Christmas Eve crowd) and make yourself a bit of extra holiday cash in the process. Forward-thinking musical entrepreneurs can very easily find themselves booked up for most of December, should they so choose. Yes, they're covers gigs, yes, you might get beer on your Strat, but trust us: Christmas gigs are a riot. Get yourself involved. You know who we're talking about. The Yule-Haters. The Anti-Cracker brigade. The Santa Deniers. They hate Christmas, and they are going to let you know it. They're not a new phenomenon - old Charlie Dickens had plenty to say about these humbug-muttering fun-leeches - but we all know one. Everybody - everybody - hates these guys. Don't let it be you. If Bruce Springsteen and John Lennon aren't too cool for Christmas, you certainly aren't. Exorcise your inner Grinch and get with the spirit of the thing. Nobody's saying that you have to become the bauble-balled spirit of Christmas, but try to appreciate that this is not the time to showcase your concept album about how very sad you are that your ex-girlfriend shacked up with your ex-drummer. Lighten up. Play some Slade. This is a time of year everybody gets to let loose and amass all the socks and gut fat they'll need to see them through the winter. Embrace Christmas and it will hold you close to its sherry-soaked bosom. You are the entertainment. Like it or not, that is your allotted role this Winter Festivus. Listen, you're the one strolling around with a guitar, buddy. Now reap the whirlwind. 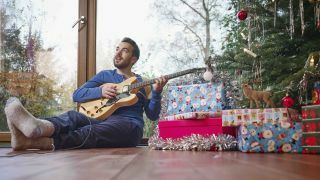 It really doesn't matter if you're tucking into your Christmas dinner, struggling home guitar in hand from a gig at 2am, or suited and booted at your work party, if you are a known guitarist and are within reach of your instrument, you're going to have to play a song. Probably several, in fact, and quite a few of them twice. Yes, sometimes you will feel put upon, especially when your turkey is cold and your beer flat, but so what? Give the people what they want, do it with gusto, and you will be greeted as a Christmas miracle. The mark of a great song is this: how many times can you hear it in a day without wanting to scrub it from existence? If the answer is once, you've got yourself a stinker. But 10? 20? 50? This is the stuff of transcendent musical genius. Fairytale Of New York is, by this definition, likely the greatest song of all time. Over the Christmas period, you may hear it five or six hundred thousand times, and yet, it will retain some nugget of inherent charm and melodic grace. There are other similar Christmas belters. John and Yoko are up there. Bruce's version of Santa Claus is Coming to Town will always be a barnstormer. Slade, Wizzard, Elton John (Step Into Christmas? Don't mind if I do, Reg), all classics. Alvin and the Chipmunks' Christmas Song? Not so much. Playing some festive hits will see you covered in glory, others will see you covered in booze. It can be a fine line - judge your audience and song choices appropriately. In fact, do yourself a favour and just consult our round-up of the 35 best Christmas songs of all time. It is a truth universally acknowledged that the number of hammered, tie-round-the-head, glass-smashing dickheads raises dramatically at Christmas. The pubs are 500% busier, and thus boast an alarming increase in the sort of people who think it's acceptable to clang your guitar with a pint glass halfway through a solo. In the moment, you will think these types subhuman scum, but have a care. They are simply accountants, estate agents, advertising copywriters. They have drunk too much, and they are being their worst selves. Give them a break, because it's these folk - the ones who make more money in a month than most of us make in a year from our music - who will give the greatest tips come the end of the evening. They wish they could be you, up there entertaining a crowd and being all musical. But they can't, and so they will, given the opportunity, buy you drinks, snap up any merch you may have, and, if you're lucky, slip some cash in your top pocket. Glory days, friends. Glory days. Heed this one, and heed it well: now is not the time to to engage your friendly local guitar retailer in extensive music-chat. If you need strings, get in the shop, buy them, get out, commando-style. No hanging around. This is the guitar seller's busiest time of year by far, and they've got a lot to do. Even if the shop isn't packed with panicked parents snapping up starter packs and associated musical tat, the staff will still have a to-do list longer than your fretboard. Sure, they're friendly and welcoming as always, but rest assured, they're not waving, they're drowning. Don't add to the problem - get your stuff, get out of their way, return for guitar chat in the new year. Guitarists love accessories. Guitarists also lose accessories at a bewildering rate. Christmas is an excellent opportunity to replenish on all the small stuff, while giving your loved ones some quick-win present ideas. If you're lucky enough to have family/friends/partners that want to give you nice things for Christmas, replenish your lost or broken guitar accessories. Funky straps, complicated capos, tuners, maybe even a pedal or two if the present giver is particularly flash - all are ideal guitar-oriented stocking fillers. Take full advantage of the generosity of others in this season of giving and fill your boots with much-needed bits and bobs. Our Christmas gift ideas for guitarists is a damn fine place to start. Quite aside from being a great time of year for gigging, mass singalongs and general musical merriment, Christmas is also simply a great time to be into music. If you have a job, you get at least week off - ample time to learn some new tunes or rock out on any new gear that spewed forth from Santa's bulging sack. Also, there's usually a glut of music-based goodness in the media come Christmas time. Best of the year album/song/artist round-ups abound, as do endless documentaries filling up the TV schedules and, for some reason, a goodly number of the year's best live performances. It's a great time to settle in with a turkey sandwich, seek out some winter inspiration and recharge the creative batteries. Make the most of it, you heathens - and have yourself a merry little Christmas, too.